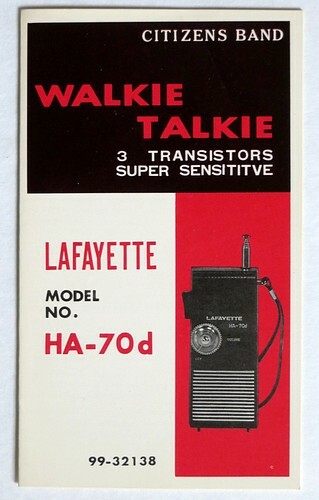 So let's check out the walkie-talkies. The quality of the plastic housing is extraordinary for $5.99. 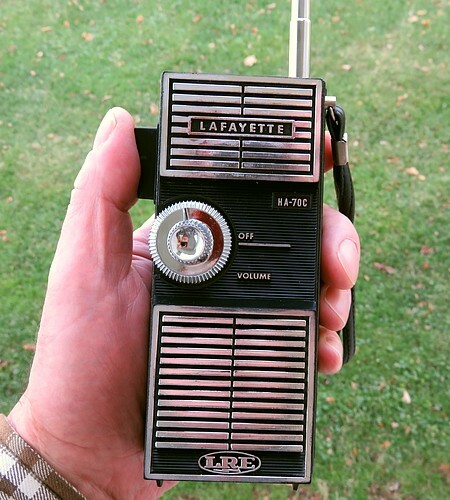 But there may be a reason for that, as well as a reason I bought the cheapest radio in the Lafayette catalog. $5.99 in 1972 is the same as about $34.53 in 2016. So we're looking at an almost $40 walkie-talkie with sales tax. 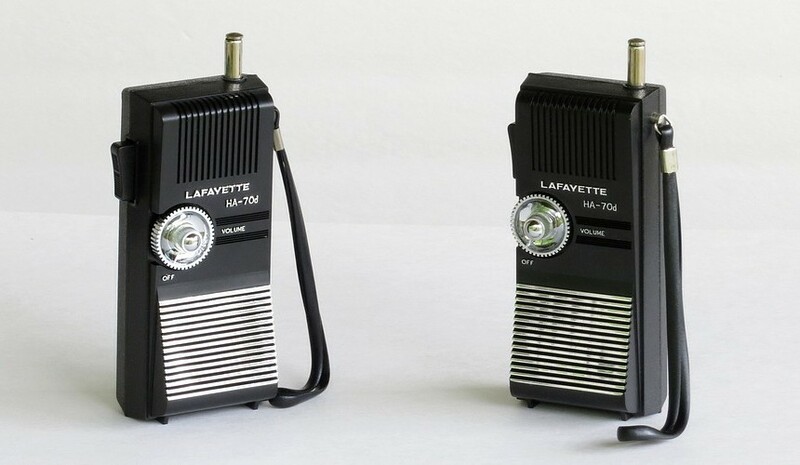 Charlie and Joe had Lafayette Comstat 19s which they bought for $59.95. That's $345.00 today, and that's why I didn't have a Comstat 19. By the way, I paid $15 each for these in 2016, which is $2.61 in 1972 dollars. The HA70d has fewer parts! Here are the two HA-70ds with their backs off. There are a few minor differences between the two. 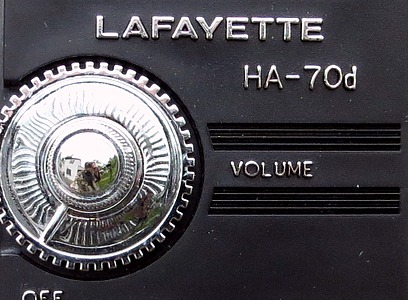 Using the "Theory of Dating Lafayette Speakers" developed during the KT-135 restoration, (described elsewhere on this site), these units were made two years apart, in 1970 and 1972. Did they make any changes in the two years? Yes, they resolved a major design flaw with a simple fix. 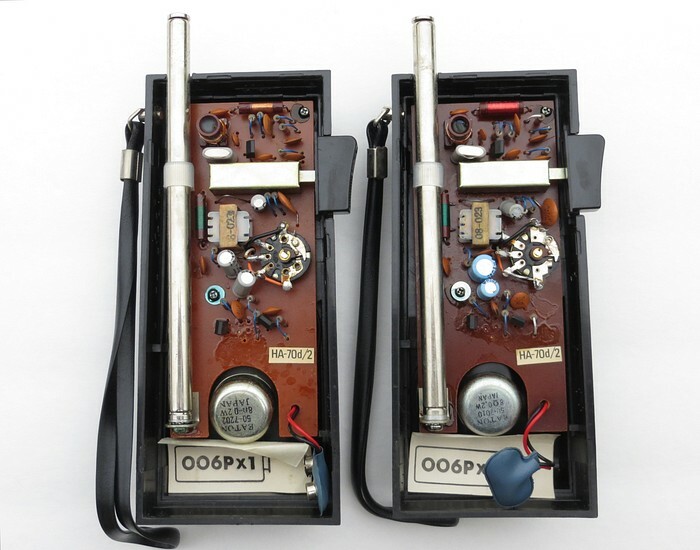 The resistor facing the Push to Talk button on the 1970 model (left) has been reversed in the 1972 model (right). 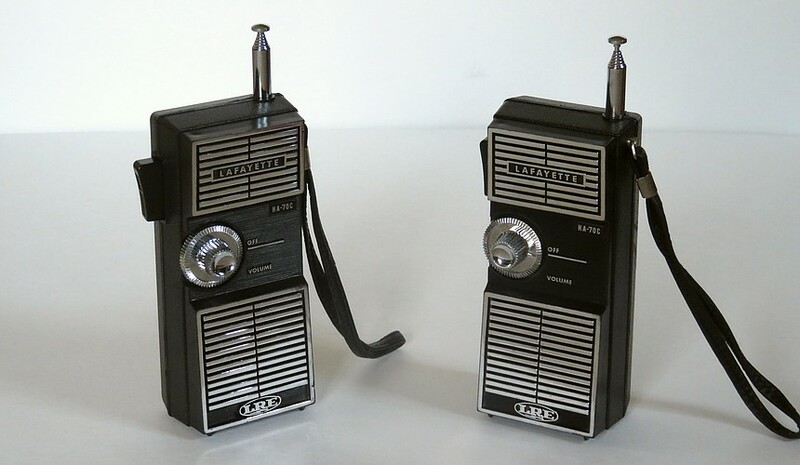 On the 1970 model, the Push to Talk button bumped against the resistor every time you pressed it. I wonder how long it would take to break the resistor off the circuit board. 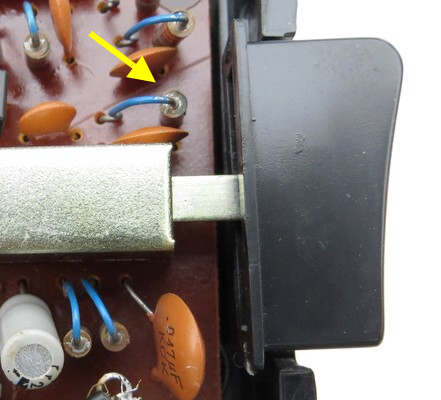 Maybe the fact that the resistor is turned around on the newer version is an accident, but if you look at the other resistors, they are ALL turned around. That's no accident. The little pamphlet states they are super sensitive, so I don't want to hurt their feelings. 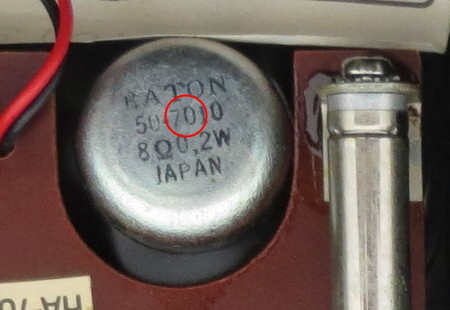 The HA-70d employs three transistors. One transistor does all the actual work as a radio transmitter and super regenerative receiver. The other two are audio amplifiers for the speaker in both transmit and receive mode. They operate on Citizen Band channel 7. 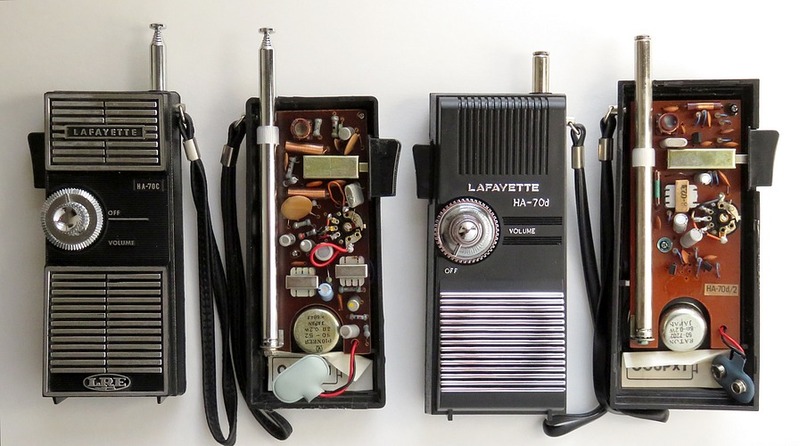 Most low power walkie-talkies used channel 14. 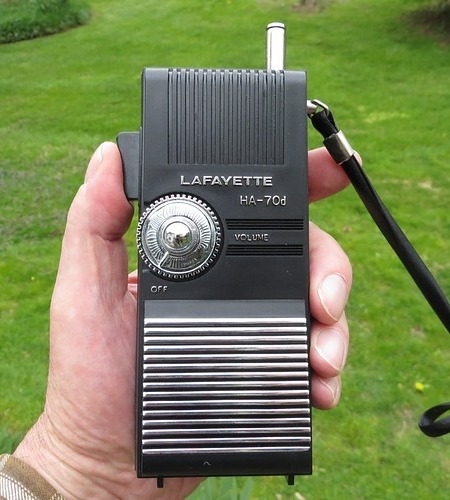 This was an advantage for the HA-70s because channel 14 was filled with all sorts of noises, buzzing and interference from all the other walkie-talkies and base stations within range. 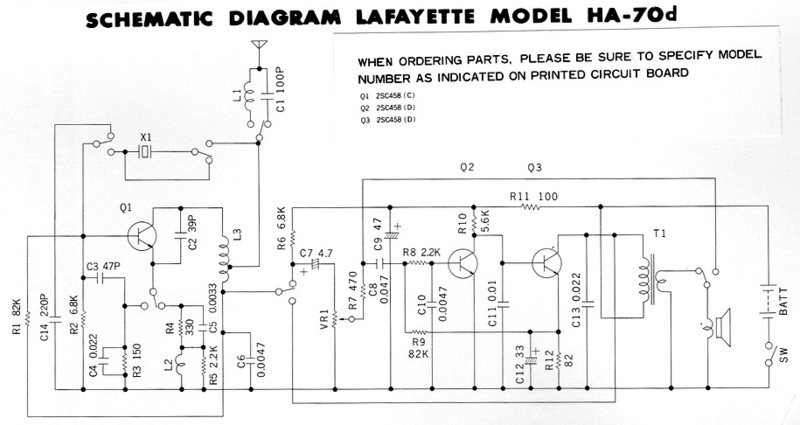 Here's the schematic. The "Push to Talk" switch is in the receive position (not pushed). The circuit is ingenious. 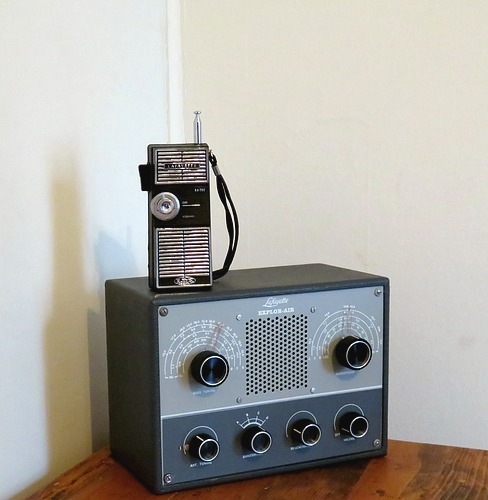 In the receive mode it's a simple radio receiver with two stages of audio amplification. 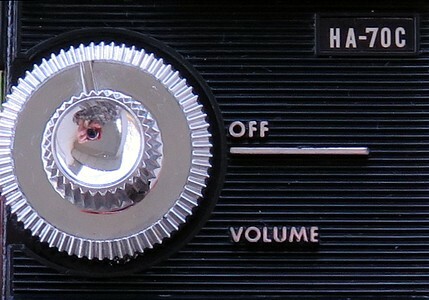 When the "Push to Talk" button is pressed, Q2 and Q3 amplify the voice coming into the speaker and feed it into the base of Q1, which is now operating as a crystal controlled Hartley oscillator, using coil L3 and crystal X1. 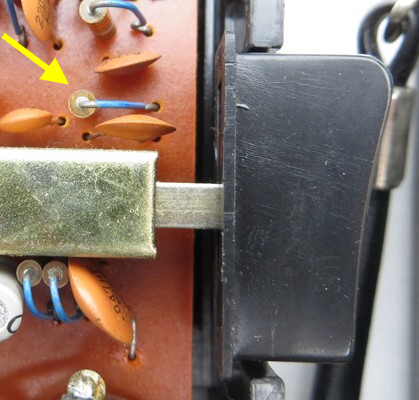 It throws a loading coil into the circuit (L1) and sends the output to the antenna. So do they still work after all these years?? We're going to test the HA-70d's now, but did you notice anything funny about the outer plastic case and the layout inside? They're used like an old fashioned telephone handset. You hold the top part to your ear and talk into the bottom part. There is, however, only one speaker! The big test! Look, we're holding the top of the units to our ears. Can't break the habit, I guess. 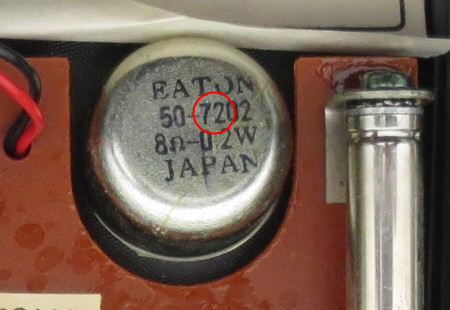 For the HA-70d test we used carbon-zinc batteries, which is what we would have had in them in the 1970's. The unit made in 1970 transmitted nicely but was stone dead as far as receiving anything. 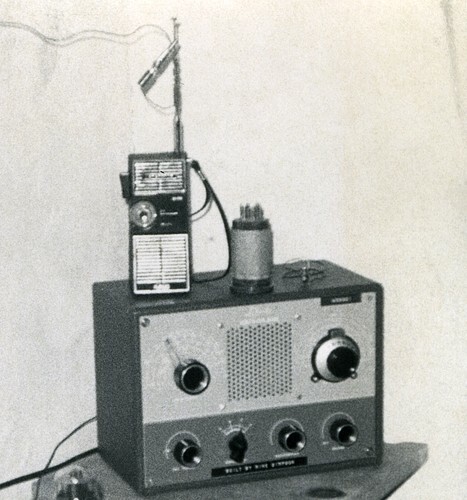 The unit made in 1972 received very well, but didn't transmit. Now you may well ask, how did we know the 1972 unit wasn't transmitting if the 1970 unit couldn't receive? 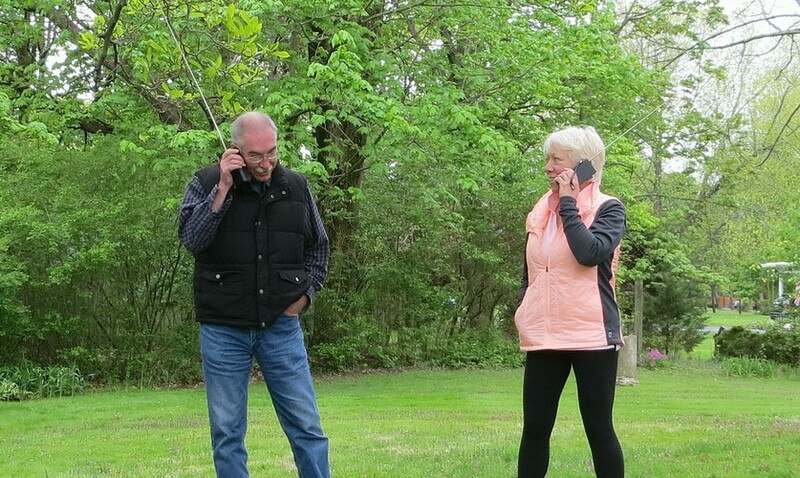 The answer is that we tuned the shortwave radio to 27.035 MHz, CB radio channel 7, and tested the walkie-talkies. 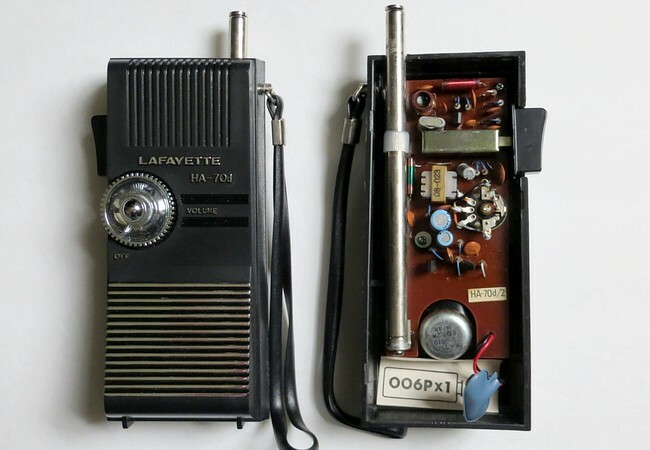 The "Push to Talk" switch was cleaned on the 1972 unit and the volume control was cleaned on the other, which brought them both to life. As a matter of fact, they worked great! When one of us transmitted, the voice was surprisingly clear to the other. Amazingly clear. And we both copied some guy who said his 10-20 was Valley Forge PA, 16 miles away. We stood about a city block apart, proving 1/2 of the claim in the manual concerning their range. Both of the HA-70Cs were also tested using the same carbon-zinc batteries. Neither one work. Cleaning the 'Push to Talk" buttons and volume controls had no effect. That's OK, I only needed one for the picture below.